Host4ASP, as the name suggests, specializes in hosting solutions for ASP.NET developers who need hosting that is based on Windows. Among their services are shared and reseller hosting and Windows VPS (all of them are Windows-based). Despite the affordable price, live chat, and easy-to-navigate website, Host4ASP customers are mostly dissatisfied with their services. The feedback, which is far from being positive, covers poor reliability and unacceptable downtime. There are several positive reviews, but they are outnumbered by claims that the services leave much to be desired. Another thing that makes a prospective customer feel uneasy is that they do not state who their owner is. Still, there is a bunch of advantages, like a lot of useful Windows features, competitive prices, and, reportedly, a reputable data center in Chicago. Currently, there are 3 shared hosting plans presented by the provider. and for $3.95/mo, $5.95/mo, and $14.95/mo, respectively, for 12 months. and SSL Certificate, to name a few. 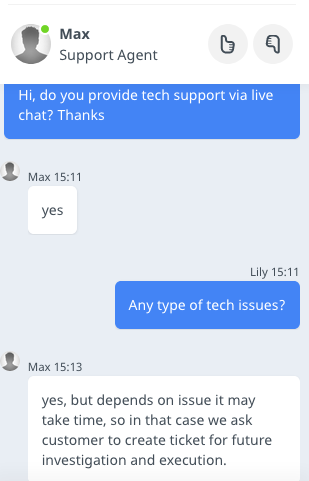 The company offers basic tech live chat support. The chat is very fast to respond. There are also email and ticket support. With 4.1 HRank and #147 on our list, there is no surprise that the negative reviews we accounted on the internet were numerous. The provider had several major downtimes as bad as ~69%, ~89%, and ~85%. The domains on the Shared IPs mostly responded slowly (900-1,100ms) and only once the response time was ~300ms. No surprise that the Sites chart reveals a decreasing trend in the number of websites.